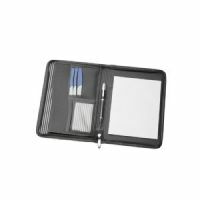 When you regularly attend meetings, particularly out of the office, having an easy way to keep your notes, papers and other paraphernalia organised is a must – after all, no one is going to take you seriously if your briefcase spills paper everywhere. The good news is that Novel Tees has a wide range of attractive and functional branded compendiums to choose from. We understand that each business is different and, as such, your personalised compendium needs are likely to differ, too. 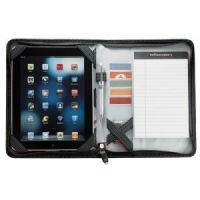 This is why we stock a variety of sizes, from standard A4 and A5 through to whole pad and tablet/iPad covers. For many businesses, promotional compendiums in Melbourne and beyond are a must-have office accessory – it provides your employees with a place to keep documents, IDs and other stationary items in the one place. It also takes form as a ready-made organiser. 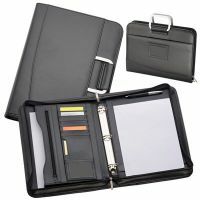 Novel Tees supplies a number of high quality promotional leather compendiums in Melbourne that are ideal for executives and make a perfect corporate gift. 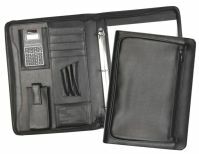 Many offer additional features, including: pen holders, cardholders, calculators and internal/external pockets. Some of our logo printed compendiums in Melbourne, Sydney, Brisbane and beyond can be further customised to promote your business; your logo or another design can be applied to the front via print, debossing and foil stamp. Full colour prints are also available (in some cases). Are the compendiums available in colours other than black? Whilst most of these products are black or dark grey in colour, some (such as pad covers, tablet and iPad covers) are available in additional colours. Please contact us if you have a specific colour in mind. Each promotional compendium has a minimum order requirement – some are as low as 10 and 25, whereas others are ordered in quantities of 50. Please let us know what product you are interested in and we will email you all information.